The new Toyota Corolla Touring Sports made its first appearance at the Paris Motor Show on 2 October 2018, joining the new Corolla hatchback. This all-new model has a dynamic design which clearly differentiates it from the hatch as a sleek, refined and versatile wagon. Developed and created in Europe, the Touring Sports body style is aimed at customers who want good looks with uncompromised practicality. The new Corolla range marks the debut of Toyota’s dual hybrid strategy with a brand new 2.0-litre full hybrid electric powertrain joining the line-up. 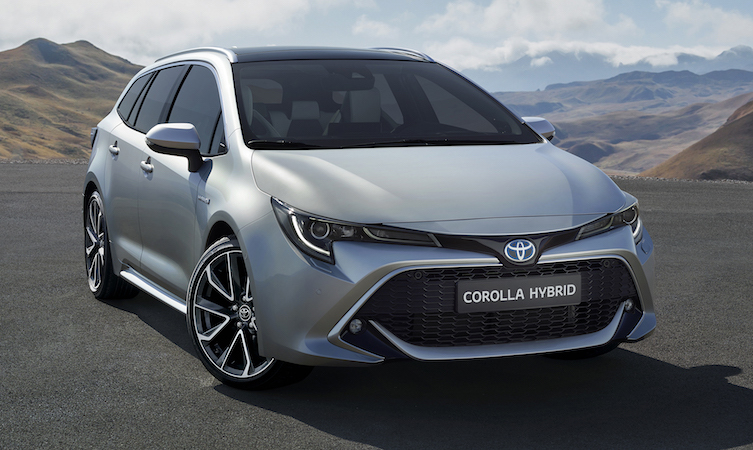 The Corolla Touring Sports reflects Toyota’s continued focus on hybrid electric technology, with just one conventional engine featuring in the range – a 114bhp 1.2-litre turbo petrol unit. This will be offered alongside two hybrids: 120bhp 1.8-litre and 178bhp 2.0-litre powertrains. The latter is unique in Corolla’s segment, as no conventional engine can deliver the same balance of performance and low emissions. The 1.8-litre hybrid is an improved version of Toyota’s current unit, offering quiet running, intuitive and responsive performance and self-charging electrified vehicle technology, together with low cost of ownership benefits. The new 2.0-litre system maintains all these qualities together with the ride comfort, stability, handling and driving enjoyment inherent in Corolla’s newly adopted Toyota New Global Architecture (TNGA) GA-C platform. The suspension features a proven front MacPherson strut arrangement and an all-new rear multilink system. New shock absorber valve technology is used and, for the first time in a Corolla, adaptive variable suspension is available. The engine’s low mounting height, the low hip point of the seats and the location of the hybrid battery beneath the rear seats help give the Corolla Touring Sports a low centre of gravity and agile handling. A comprehensive range of technology features for comfort and convenience will be provided as standard on high-grade models and available as options elsewhere in the range. These include a world-first 3D driver’s meter, premium head-up display, a JBL GreenEdge Premium sound system, wireless mobile phone charging and the Toyota Touch multimedia system. The new Corolla Touring Sports was styled in Europe at Toyota’s recently opened Design Centre in Belgium. Thanks to the use of the TNGA platform, the new wagon is no longer simply a variation of the hatchback but has become a distinct, separate model in its own right. The wheelbase measures 2,700mm, helping achieve best-in-class rear legroom. The design generates a refined, sensuous appearance, with the sweeping roof line of an elegant yet robust estate car. This sporting profile is reinforced by the wide, flared wheel arches, their edges hemmed so the wheels can be positioned further outboard, emphasising the car’s wider stance and lower centre of gravity. At the rear, the design theme is witnessed in muscular shoulders, widely spaced full-LED lamp clusters and a raked rear screen. The deep rear bumper reflects the catamaran shape that features in Toyota’s current design language. Exclusive to its market segment, the Corolla Touring Sports will be available from launch in four optional bi-tone colour schemes. These match the body colour with a black roof, pillars and lower front grille surround. The all-new interior creates a spacious, modern and cohesive cabin environment in which new textures, colours and trims combine to offer the highest levels of visual and tactile quality. This is in line with the model’s development to appeal specifically to European customers. Thanks to the new GA-C platform, the front seat hip point is set lower, which in turn helps secure a lower centre of gravity for the car while providing a more engaging driving position. Furthermore, the front to rear seat couple distance is 928mm, giving ample space for rear passengers. The loadspace has a VDA capacity of 598 litres and is equipped with a number of features for ease of use. Very nice. Hmm I wonder will the 2L 178bhp have paddles ? What a lovely looking car, can’t wait until it is available in the show rooms. It’s great to hear your enthusiasm, Tim! It’s great to see your enthusiasm, Andy! Thank you for your enthusiasm, Gavin! It says that the battery will be located under the rear passenger seats, a location for the fuel tank, does that mean it will feature a smaller capacity tank? Thanks for getting in touch. Details on the Corolla will be released nearer to the Paris Motor Show.